Phil Martelli says he wants to coach some more. Phil Martelli said he has not read the three-paragraph statement that St. Joseph’s University put out Tuesday. announcing the end of his tenure as men’s basketball coach. He’s not being a smart aleck, Martelli added. Or words like that. “I’m not walking forward yet, but I’m crawling,’’ he said. Martelli was outspoken in his unhappiness over how Temple had handled the news of the departure of Fran Dunphy this time last year. He was incensed. I asked him a loaded question: How did St. Joseph’s handle the departure of Phil Martelli? He pointed out he was at 54th and City Avenue more than half his life. But he isn’t disputing the school’s right to decide. But the suddenness of how this came down, with a firm decision he couldn’t counter. Phil Martelli talking with his players during the Atlantic 10 Tournament last March. How should it have been handled? 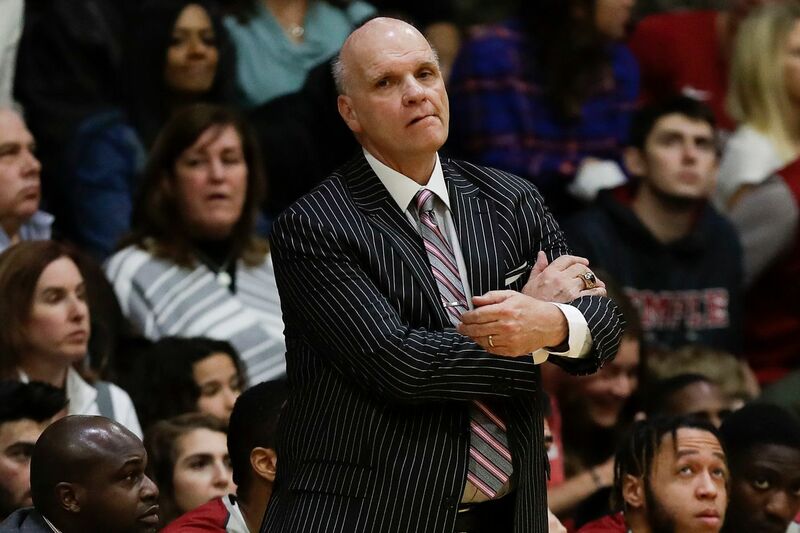 Martelli said he was given the choice, in a conversation earlier this week with St. Joseph’s president Mark C. Reed and athletic director Jill Bodensteiner, to announce he was resigning or retiring. “It would not have been honorable — and it didn’t take me long to answer the question,” Martelli said, adding that he believed he had asked his players to commit not just to the school but also to him. He wants to return to the sideline somewhere. The average person might be surprised that Martelli, who will turn 65 in August, said he wants to coach more. Not television, where most of us feel he’d be a natural? Being on an NBA bench doesn’t interest him? Martelli said confidants have told him he should be an observer of the NBA as that season winds down before he rules out such things. He’s not ruling out anything, since he doesn’t know what the possibilities actually are. An editorial note: A three-paragraph farewell announcement, which included a clumsy reference about the intent “to develop a sustained culture of excellence" — that was a shot, beyond unnecessary, straight to insulting. Maybe Martelli didn’t read it, but it’s hard to read it any other way. St. Joe’s had three straight losing seasons. But such a phrase seemed to miss the bigger picture of all Martelli had achieved. He’s been touched by so much this week, he said. He doesn’t know who bought space on electronic billboards saying “Thank You Coach Phil,” but he was touched. He was really touched by the parents of a couple of past Hawks recruits who reached out describing such a positive recruiting experience, because those recruits didn’t end up choosing St. Joe’s. It was tough to leave Dunphy alone, since he was coaching Temple on Tuesday night, so Dunphy called him. Martelli felt bad about that. Maybe there was no way to do this without taking Martelli down. He’s a prideful guy. After 24 seasons, he wasn’t ready to go. But he knows he’s gone.